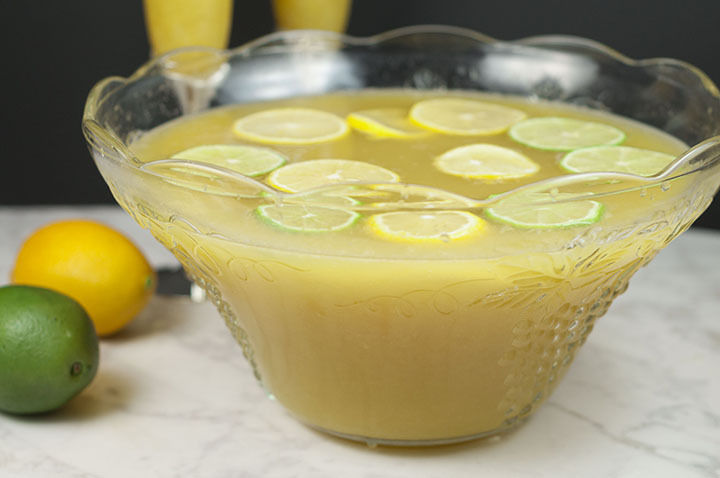 This simple, refreshing Lemon-Lime Champagne Party Punch recipe will be a hit at any holiday party, bridal or baby shower, and New Year’s Eve! Non-alcoholic version included! Well, it’s pretty much the end of 2016. What are you doing to celebrate? 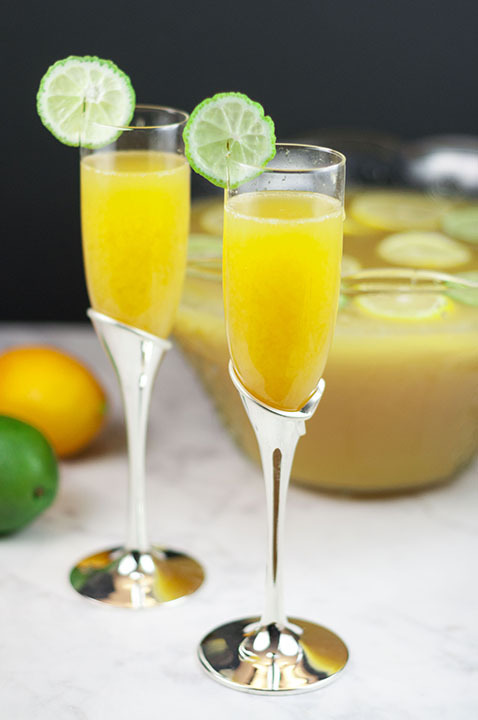 On a typical year, I would be having friends over for a party and preparing this amazing Lemon-Lime Champagne Party Punch to kick off the festivities. This year I’m off to my step-sister’s wedding! I’m sure that will be a fun celebration and I’m looking forward to it. 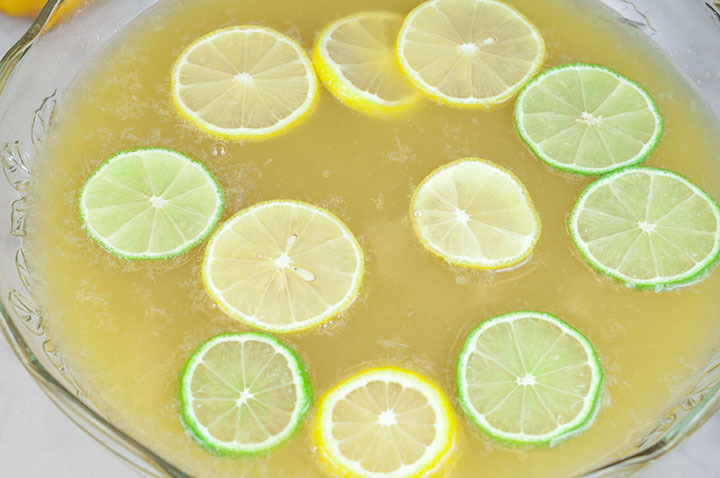 Have enough for two batches of this Lemon-Lime Champagne Party Punch because I PROMISE you that it will go quick! I definitely taste tested this at 10 a.m the other day…(food blogger problems). I may or may not have had to do this also with my White Christmas Coconut Margarita Punch. The timing just worked out that way. You’re totally judging me right now, I can feel it. To make this non-alcoholic and kid-friendly, just swap out the champagne with extra Ginger Ale. It will still taste amazing and Ginger Ale is always a good substitution for champagne. It still has the amazing bubbles and a similar color to the sparkling wine. This punch is a very pleasing alcoholic punch to start a party going as it is both colorful and tasty. 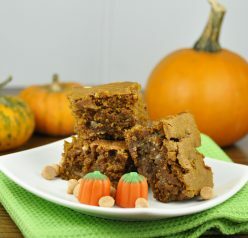 It could not be any easier to put together and it’s not overly sweet (although the ingredients may seem like it would be). 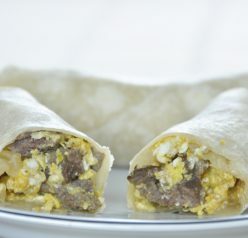 Serve it at any party, in any season, or even a bridal or baby shower. It’s practically perfect in every way. Cheers to 2016 and be safe! Step-By-Step Video on How To Make This Punch! 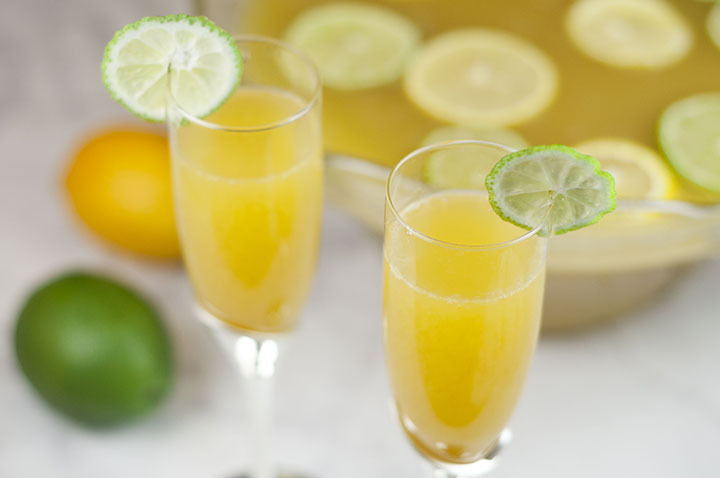 This simple, refreshing Lemon-Lime Champagne Party Punch recipe will be a hit at any holiday party, bridal or baby shower, and New Year's Eve! Non-alcoholic version included! Mix the 3 juice concentrates in large punch bowl until combined (do not add any water). Stir in the Ginger Ale and then add the champagne. Do not stir after adding the champagne. Add lemon and lime slices to the top, for garnish. Enjoy! Definitely no judging here! Your lunch looks amazing and I love the non-alcoholic version for the kids. Happy new year! 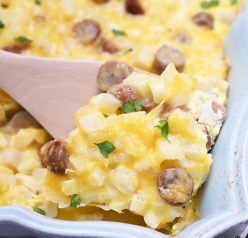 This looks so festive and perfect for any of the cold weather holiday gatherings! So much citrus deliciousness in every sip!! Perfect holiday punch. Happy New Year, Ashley!!! My sister in law makes a similar punch at Christmas…. and it’s sooo good! Cheers! You just can’t go wrong with this kind of party drink! I love practically anything with citrus! Your pics are gorgeous!